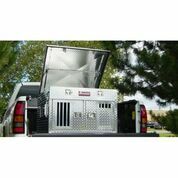 Protect your dogs while safely transporting them with Owens Products' Double-Compartment Hunter Series Dog Box and still have plenty of room for your gear. Rugged diamond-tread aluminum construction looks great and delivers weather-resistant performance. Dual lined dog compartments have lockable slam latch doors with storm covers to keep your four-legged friends dry and generous 10"H x 7"W air vents to allow maximum airflow. Spring-loaded carry handles won't rattle. Large storage compartment on top closes easily with a pull strap.